I know that all children (including Mila) are eagerly waiting to open their advent calendar and get a little treat before going to school. This year, I’ve made our own advent calendar with plain white matchboxes and hung them with Command Brand transparent plastic hooks. Both can easily be found on Amazon. These Command™ Clear Decorating Clips hooks are fantastic to hang Christmas decorations without damaging your walls. I also use them on styling projects, to hang garlands in Mila’ bedroom or for her birthday party. The other thing I use a lot all year long is their picture hanging strips. I think is worth mentioning this article again because I regularly see people on Instagram asking how they can hang picture frames without drilling into their walls. Each time I’m like “Command Brand people, Command Brand!” (please read it if you haven’t done so, you will thank me). Once you have everything listed below, it should not take you more than 20 minutes to make your own advent calendar. First, split the 24 boxes into 3 columns on your table. Column 1 will be for 1st December to 9th, column 2 for 10th to 19th and column 3 for 20th to 24th December. Then, write down on a piece of paper all the numbers from 1 to 24 and work out how many of each number you will need to stamp (i.e. #1 for 1st December + 10th to 19th = 20 boxes need to be stamped with #1.). Once these are dried, you can start stamping the second number for days 10th to 24th. 3) When all the boxes are dried, wrap red Christmas ribbon around each of them. Leave at least 40 cm (15.748 in) ribbon to hang them. They don’t have to be the exact same length as I think they look nicer when hung in a cluster. 4) Unpack your Command Brand transparent plastic hooks, and hold each of them strongly onto your wall where you want to hang your advent calendar. 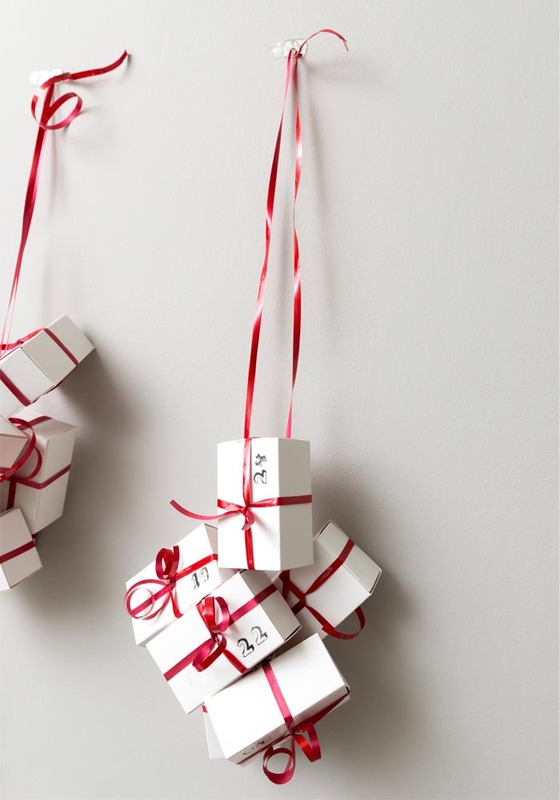 Christmas decorating has never been so easy! Like all Command Brand products, these Command™ Hooks are easily removable. The thing I love the most about them is that they do not leave marks or stains on the walls. I also used Command Brand plastic hooks to hang a fairy light on the mantelpiece. As you can see from the images below, the transparent hooks are very discrete. All you can see are the Christmas decorations and that’s what matters. The Command™ Hooks products are available from most DIY stores, supermarkets like Sainsbury’s, Tesco, etc. and of course from Amazon here. I hope this Advent Calendar DIY will inspire you to make your own and maybe get the children involved for a fun, crafty afternoon. You can find more creative projects here. Posted in partnership with Command Brand all views my own. Thank you for supporting the brands that help support BODIE and FOU. Awesome post, Thank you so much for your useful post.